This is a continuation of the fruit and veg theme (click on the “EMFV” in the TAG CLOUD for the other posts). Now carrots should be an easy win. Who doesn’t like carrots? Three tablespoons equals one healthy portion – which must be about one and a half carrots. They are packed full of vitamins A and C, although again much is lost in cooking. It rather seems as though cooking is a bad idea when it comes to eating vegetables in a healthy way. 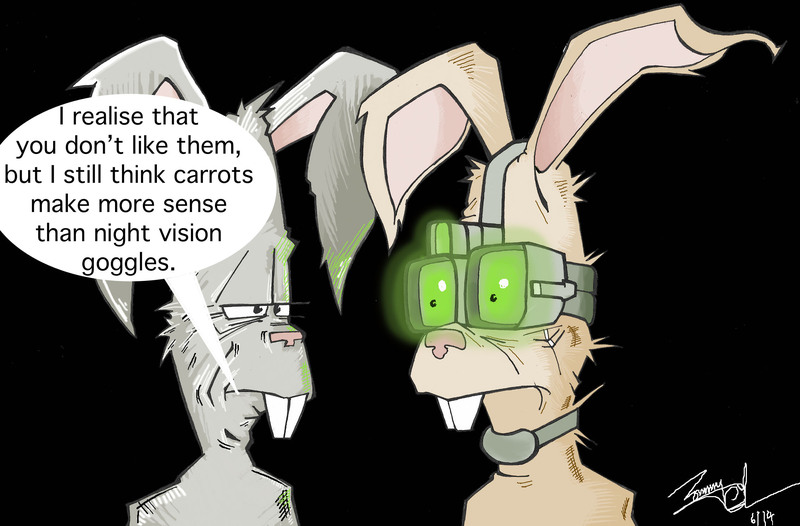 Still, raw carrots aren’t so bad, certainly rabbits think so. Stay safe. Stay off the road when you’re eating your carrots, or it may not be healthy eating after all ! There is not much one can comment about concerning this blog, except maybe if one converts the honourable carrot into a fine wine and produce a vintage carrot wine, to enjoy with a meal, and take ‘sniffers’ too in the early and late evening/ Maybe one then may see double, and have double jepody when walking the straight line home, or within the home to beddie boses! I am sure some oldies from the 20th centuary can recall some hard times when the inginuitiy of the human soul developed some form of acholic beverage, from the allotment, including carrotts. I do remember our next door neighbours asking my parents and my siblings to taste a little drop of dandilion wine, so carrot wine could not be far away. I was about 12-13 the neighbours believed it was naught but nice to offer me a ‘sniffter’ with my sisters, and as it was home brew it was not like drink ‘HOOCH’ or other strong fortified wines, for the over 18’s!. Dream on macduff as I grew older I prefered and still do a pint of good old english ale, and carrots, that is what ‘hewee’ and i discuss, when i rather have had one over the eight?